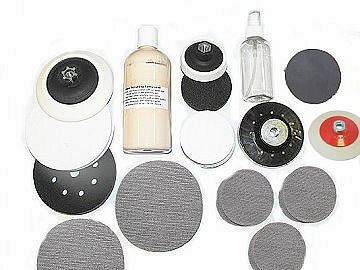 Glass Technics's "Distortion Free Glass Scratch Removal and Polishing Kits" are very popular with worldwide sales. Our very satisfied clients include leading names in the aviation, marine, railway, automotive and commercial building industries who include : FlyBe, Higgs and Hill, Eurocopters, Sunseeker International, Vectra Aerospace, Bombardier, Alexander Dennis, Barratt Homes, Falcon, Vinci plc, Scheldebouw, Yuanda and many more. 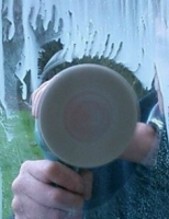 * Removing scratches and polishing commercial glass is significantly cheaper than replacing it. 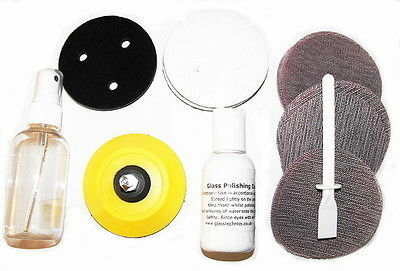 This kit can be supplied with a Dual Action Random Orbital Polisher instead (same as kit #3 below) if required, for an extra £28.00. Please request at time of order. 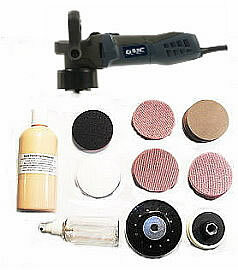 The DIY Kit is designed to remove light surface scratches / blemishes in glass. The backer pad fits into an elctric drill chuck.